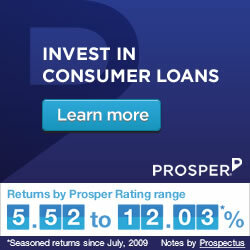 Recently, Prosper shared that lenders are earning an average of 10.4% returns. In celebration they are offering a bonus of $104 to the first 200 people that sign up after noon Pacific today! I’m a fan of peer to peer lending as you may remember. This is a great offer that doesn’t require you to put in any of your own money to start lending and earning money. If you already have an account with Prosper than take advantage of other cash back promotions available. Don’t forget to share this deal your friends so they can start earning at Prosper today! I just signed up. Thanks for sharing this! Next post: How Do You Plan For Financial Disaster?